At least 38 people were killed in air strikes in a Syrian rebel-based village in Idlib province. At least 50 people were injured. The attack was carried out on Friday night. According to the Syrian Observatory for Human Rights Watch, Reuters reported. 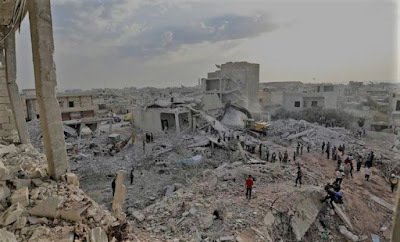 Citing the director of the Observatory, Rami Abdurrahman on Friday, the news said some battleships attacked the village of Jordan in northern Idlib in the night. The warplanes are probably Russian. This is one of the biggest casualty killings since March. Later, the number of deaths will increase further. Abdurrahman said the condition of the injured was critical. Rescuers are trying to rescue the people buried under the ruins.